Never ones to stand still in pursuit of the next technological breakthrough, at Cosworth we are using our decades of powertrain expertise to manufacture a brand new generation of piston. 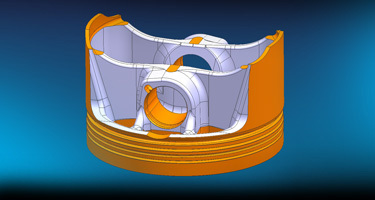 Working in collaboration with Aerospace Companies Materion Corporation, BRP-Rotax and with support from FAC and NATEP, we are aiming to create a significant step change in lightweight, robust and high performance pistons. By leveraging our 60 years of experience in developing engines for racetrack and road, Cosworth has developed an unrivalled knowledge of the interaction between the piston and other engine components. We have long pushed piston design and manufacturing to improve the interaction with the engine and other components, delivering performance gains for our clients in the automotive and motorsport sectors. For this latest pioneering project, we are using SupremEX®* metal matrix composite (MMC) aluminium alloys to increase strength, stiffness and reduce fatigue to produce wear resistant pistons. This innovative approach has been designed by BRP-Rotax and manufactured by Cosworth in its state of the art facilities. 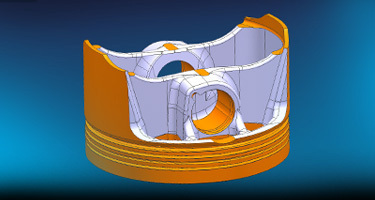 A higher specific modulus creates a lighter, stiffer design that, in turn, improves fatigue in highly stressed areas. 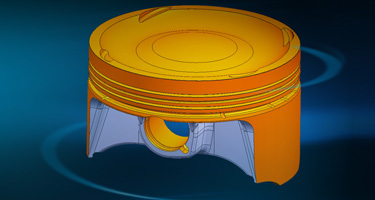 Increased material strength saves 20% mass over conventional materials, leading to reduced friction and enhanced piston life at elevated temperatures. Lower thermal expansion allows a tighter control of piston to liner clearance reducing piston slap, blow-by-oil carry over and crevice volume, providing increased efficiency. Higher working temperatures and combustion pressures can be achieved due to greater fatigue resistance, with lower coefficient of friction and increased wear resistance contributing to improved combustion efficiency, brake specific fuel consumption and hydro-carbon emissions. 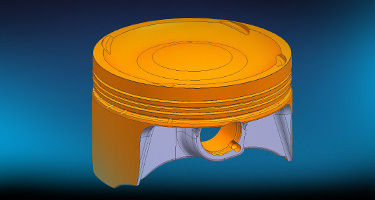 The result is a piston with an immediately superior finish to standard variants. When coupled with our innovative oval skirt profile, polished crown, anti-detonation bands, accumulator groove, profiled pin bore and DLC gudgeon pin technology, the end products allow Cosworth to remain at the pinnacle of piston design. *SupremEX metal matrix composite is a registered trademark of Materion Corporation.